Edward Burra, not exactly an ‘Outsider Artist’, never seemed to quite fit in to any particular art canon. After visiting the first solo exhibition of his work in 25 years at Pallant House Gallery in Chichester earlier this year, I could see connections with German Expressionism, Surrealism, and potentially Impressionism – connections which I will discuss in more detail later in this post. However, despite being named one of the most acclaimed modern British artists, his work is somewhat unknown to the majority. Working predominantly in watercolour, Burra’s work is unlike any other pieces found in this medium. He uses the paint to produce a bold, solid colour – a characteristic that made his work centre stage at Tate Britain’s recent ‘Watercolour’ exhibition. Burra’s work encompasses four main themes; the first being the almost voyeuristic depictions of prostitutes and drinkers, then there are his more macabre, surrealist works, then his landscapes and, finally, his theatre designs. His depictions of the Hollywood scene and life in Harlem – in which he represents drinkers, prostitutes and immigrants – are almost comparable to the work of early Impressionists working in Paris in the late nineteenth century. The voyeuristic, almost flaneur-like gaze of the artist represents the woes and tribulations of modern industrial life. Similarly to Eduard Manet and Pierre-Auguste Renoir, Burra plays the flaneur in these works, for example in his piece entitled The Snack Bar (1930), which depicts a prostitute in a café-bar. Comparable to Manet’s scenes of café-life, such as At a Corner Café-Concert (1878), Burra’s work unashamedly depicts working-class urban life. The idea of the flaneur, a theory highlighted in the work of Charles Baudelaire, is that the artist depicts fleeting moments in time; capturing everyday life on the canvas – or in Burra’s case, on paper. Burra’s work has already been compared by many to the work of the German Expressionists Otto Dix, George Grosz and Max Beckmann. The German Expressionists used their art to portray their discontent with the rapid modernisation and industrialisation that was taking place in Germany during the early twentieth-century. Similarly to Burra, they worked in bold, solid colour, with harsh lines and also depicted the turmoil and dissatisfaction that is often a companion to the loneliness of modern city life. Dix, Grosz and Beckmann, amongst other Expressionists, were not afraid to show the dark side of urban life; the back streets, the macabre and the poverty; subject matter that resulted in the their inclusion in the 1937 Degenerate Art exhibition in Munich. Despite the difficulty to place Burra within the traditional art historical canon, his work is definitely something to be celebrated. His use of watercolours can only be admired; from a distance, it is impossible to tell that his courageous use of colour is produced using this medium. His work shamelessly depicts the underworld of modern urban life; a theme that is iconic and almost representative of works produced during the early twentieth-century in Western cities. 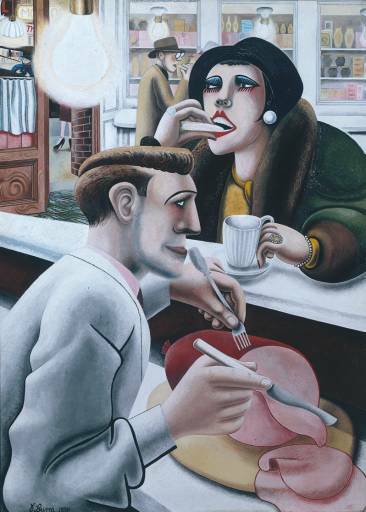 The Edward Burra Exhibition, which began at Pallant House Gallery, Chichester earlier this year is now touring. You can see this exhibition at the Djanogly Art Gallery until the 27th of May 2012.